The northbound road through Big Bend National Park winds between scab-colored volcanic hills and the baking white flats of the Chihuahuan Desert. During the day, little moves out here but the wind; the heat presses down heavy and hard on the rock shelves. The landscape feels frozen, dry, and dead. In a word, timeless. Look again. The desert that seems timeless today is a recent novelty, a blip on the geological record, and its seeming stillness contains parts of everything that has gone before. In the high Chisos Mountains, the last remnants of ice age forests linger on the cool sides of a massive extinct volcano. Lizards bask on the white limestone along Santa Elena Canyon, bobbing their heads over the black shapes of preserved oysters. Storms roll over the desert, dumping rain that once was seawater into the thirsty soil. And out by the park’s new Fossil Discovery Exhibit, you can see a roadrunner like a little velociraptor panting in the shade, lingering by a case that contains a distant cousin’s bones. 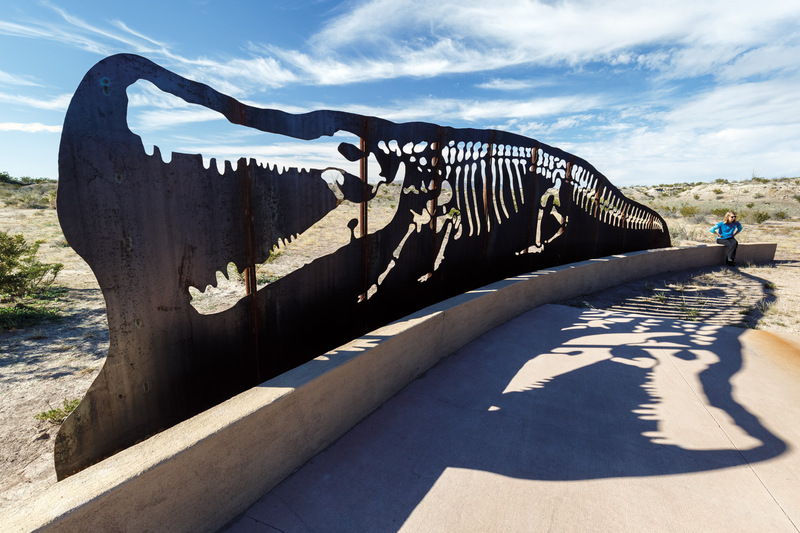 Open daily from dawn to dusk, Big Bend’s Fossil Discovery Exhibit is 8 miles north of Panther Junction on the Persimmon Gap Entrance Road (US 385). Then there are Big Bend’s fossil layers. Park Geologist Don Corrick describes them as a worldwide treasure: Few other places offer such a tantalizing record of the earth’s changes through the age of dinosaurs and beyond—with more than 1,200 fossil species spanning 130 million years. Hiking across the surface of deep oceans of time, with oysters and extinct mollusks suspended in desert trails, we experience this magic not as it is curated by a museum, but as a past environment woven deeply into an actual place we can see, touch, hike, or paddle. Paddling on the muddy Rio Grande, you might picture yourself transported to that ancient ocean, your canoe rocking in its blue-green waters. Seabirds with sharp little teeth bob on the waves, while flying reptiles called Pteranodon soar on the breeze or dive into the depths after fish. The water is too warm for corals. Instead, the reefs are formed from overgrown jumbles of giant clams. Massive sharks and a piranha-faced fish named Xiphactinus patrol over the reef like dark shadows, hunting smaller prey. But they aren’t the biggest mouths here. Floating on the waves, you see a huge scaled head appear at the surface like a sea serpent. A translucent eyelid flicks across a golden eye, and salt sneezes out from slitted nostrils. The head belongs to a mosasaur, an immense sea-lizard that looked like a cross between a komodo dragon and a shark. A few species are known from the Big Bend, including the swift Platecarpus and the 45-foot Tylosaurus, which had a nose like a battering ram and fanged jaws. The mosasaurs ruled the world’s oceans until the end of the age of dinosaurs. But their time in Big Bend came to a close long before that. Imagine the sun burning down over a bronzed floodplain. Through a patchwork of lush fern prairies and groves of conifer comes a herd of longnecked dinosaurs. Picture yourself beside an ancient riverbank. You’re standing inside a hundred-mile tapestry of slow, braided waterways and brackish swamps. The banks around you are thick with trees like pine, cypress, and palmetto palms. The humid air is heavy with the smell of mud, the whining buzz of insects and the hoots and hisses of dinosaurs. You can hear big animals moving through the brush now and then. If you watch, you might see a hint of a colorful crest or a lashing tail. You’re in luck. A group of horned, frilled dinosaurs called Agujaceratops—like a smaller Triceratops—have come down to the bayou’s edge to drink. Mud squelches between their padded toes. They toss their colored frills in the dim light, clacking their sharp bills. But they have to be careful here, at the edge of the water. There are hunters in the forest like teratophoneus, an early relative of T. rex that strides about on two slim legs, ambushing anything that isn’t paying attention. But the most dangerous animal in these swamps is resting in plain sight. On the opposite bank, an immense 30-foot alligator named Deinosuchus sprawls in the shallows. Its body is armored in domed bits of bone, and its eyes glitter as it watches the horned dinosaurs drink. This enormous gator lived on both sides of the inland sea, and it might occasionally have crossed between the two shorelines. But its most famous fossil remains—a collection of skull and jaw fragments—come from the Big Bend. Like modern alligators, Deinosuchus was a patient predator. Its broad, powerful jaws and stealthy swimming gave it the ability to devour anything from turtles to predatory dinosaurs. You’re out there in the desert. Imagine it changing, growing greener and flatter. Now instead of a desert, the sun burns down over a bronzed floodplain. Through the patchwork of lush fern prairies and groves of conifer comes a herd of 98-foot, 72-ton long-necked dinosaurs called Alamosaurus, mountains of flesh with long necks and whipping tails. Pterosaurs and primitive birds flit around them, pursuing biting insects. Rumbling calls almost too deep to be heard roll over the air. Bones from Alamosaurus’ limbs and neck are the most common dinosaur fossils in Big Bend National Park. But while Alamosaurus is possibly the largest of North America’s dinosaurs, what makes it really interesting is the fact that it shouldn’t be on these plains at all. Other sauropod dinosaurs disappeared from the continent 35 million years before Alamosaurus came along. Where did it come from? Some researchers think Alamosaurus arrived from South America, which still had long-necked dinosaurs. Whatever its origins, it’s both the last and among the largest of its family to live in North America. Another of the landscape’s giants was the flying reptile Quetzalcoatlus. In 1971 by paleontologists prospecting in the western portion of the park when they came across what they later called “the big wing,” a partial arm and finger from an animal with an estimated wingspan of about 33 feet, making it the largest known flying creature of all time. Once alone among the ranks of giant pterosaurs, it’s now the most mysterious member of a growing family, with scientists reconstructing its lifestyle and movement by looking at its relatives. It seems that Quetzalcoatlus was quite comfortable on the ground. That means it probably stalked along open prairies like a cattle egret, using its long neck and beak to spear up prey. Now some of them are following the Alamosaurus herd, gobbling small animals frightened by their massive footsteps. Next to the long-necked dinosaurs, the giraffe-sized flying reptiles look spindly and small. In a nearby stand of trees, something stirs. A heavy, scarred head swivels, calculating its chances. This is Tyrannosaurus, the one dinosaur that needs no introduction. Like the other two, Corrick says, its presence in the park is known from scrappy remains, in this case parts of a skull and isolated vertebrae. Scientists still argue whether it had feathers or scaly skin. But nobody argues about its bone-crushing bite and a nose capable of following injured prey for miles. Right now, there’s something out there on the plains that interests her: a young long-necked dinosaur—only about 30 feet long—is lagging behind. The desert that seems timeless today is a recent novelty, a blip on the geological record. In movies, dinosaurs roar when they attack. But in the wild, predators attack in silence. The Tyrannosaurus breaks cover in a quiet, loping run, her long legs eating up the ground. She’s on the Alamosaurus quickly, her heavy jaws crunching deep into its side. Then she falls back, ducking away from its lashing tail. Like a modern Komodo dragon, her bite is fierce enough to inflict hideous damage on a larger animal. Now all she has to do is follow her wounded prey at a walk, occasionally nipping at its flanks, waiting for exhaustion and infection to bring it down. Eventually patience will win out; she’ll sit by the carcass for days, gorging, before leaving it to Quetzalcoatlus and feathered, darting raptors. Perhaps she’s feeding there when the world ends. Even so, what happened next is clear in the rocks. The crust buckled upward, building great volcanoes. Under these explosive mountains, forests and savannas spread out and were roamed by a parade of mammals. At first, these were brontotheres—animals like rhinos with huge clubs on their noses—and early, multi-toed horses. But as time passed, the inhabitants of Big Bend became more recognizable: mammoths, camels, and saber-toothed cats. The world grew colder, and evergreen forests swept down from the north, covering Big Bend. When the ice age retreated, those forests stayed. The Big Bend would have looked like a cross between the African Savannah and the mountains of Colorado. Mammoths, saber-tooth cats and American horses all died out at the end of the Pleistocene, possibly due to the arrival of humanity. They left behind even more familiar animals: cougar, jaguar, javelina, deer, and elk. For a while, they lived in the scrub forests and flatland plains. But 8,000 years ago, Corrick says, the drying climate began squeezing out the park’s lowland forests. The transformation was complete. Where once there had been an ocean, now there was a desert, nourished by the summer monsoons, green on the mountain slopes, tan and blistering in the lowlands. This is part of the Big Bend’s magic: the realization that the world can and will change in unimaginable ways. Eight miles north of the national park’s visitor center at Panther Junction, you’ll find a reddish-brown sign advertising the Fossil Discovery Exhibit. 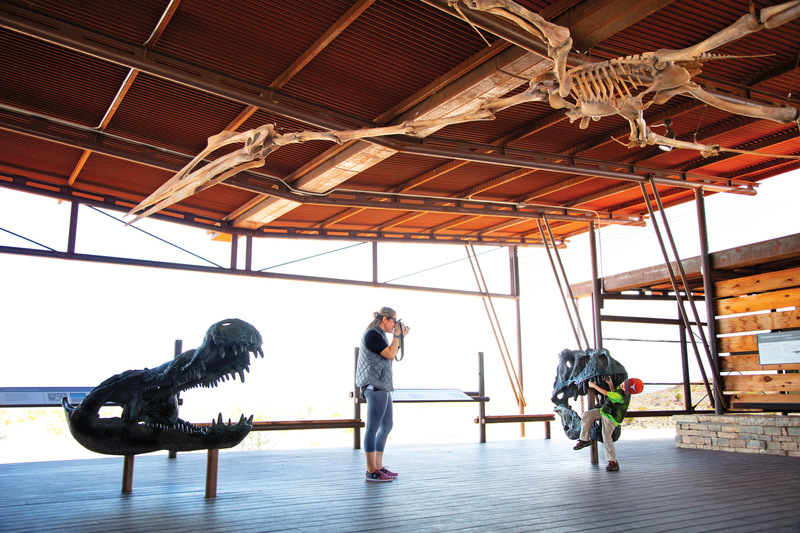 Open since January 2017, the exhibit is a small temple to the paleontological history of the park, an open-air building constructed of rust-red bars that blend with the desert. Visitors wander through, looking at fossils and fossil replicas in glass cases or lingering by murals depicting the prehistoric past. 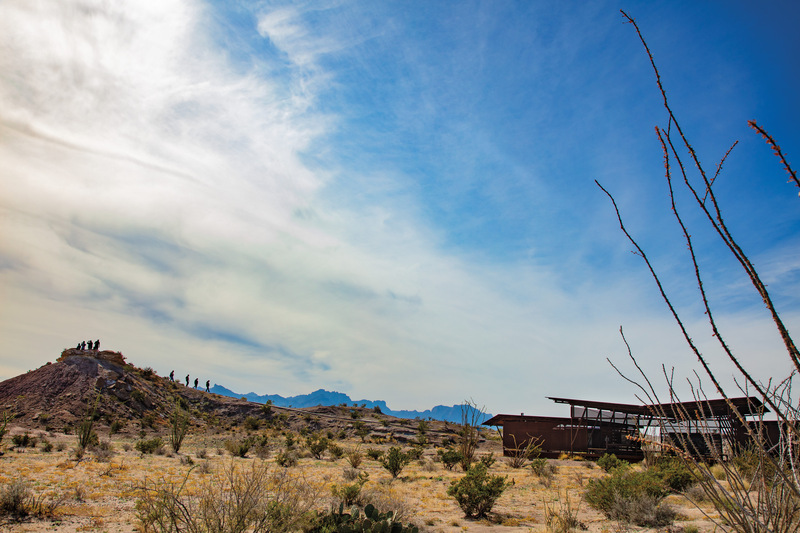 Just beyond the exhibit, a footpath leads 100 yards to a low hill offering panoramic views of the lava-formed Chisos. We can’t time travel to vanished worlds. But in the Big Bend we can open our eyes and walk out into the desert, touching rock that has been many things, and will be many things in the future. And that’s the next best thing.